Patients such as this have a very similar complaint, that they look tired. 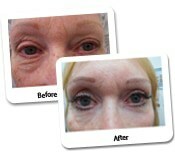 The bags under the eyes and excess skin on the upper lid create a heaviness which can only be removed surgically. There is creasing around the lower lid caused by looseness of the skin. Patient is a good candidate for upper and lower Blepharoplasty to remove excess skin and tissue and lower lid Erbium to tighten and smooth the skin. Patient post lower lid Blepharoplasty. The large bag of fat from the lower lid has been removed and is now lovely and smooth. 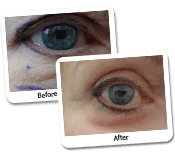 The deep crease around the lower eyelid has been significantly reduced to a more aesthetic look. There are many cosmetic procedures that can have a rejuvenating effect on the face. Eyelid Surgery Before & After Photos has become one of the most popular procedures for both men and women looking for an anti-ageing treatment. 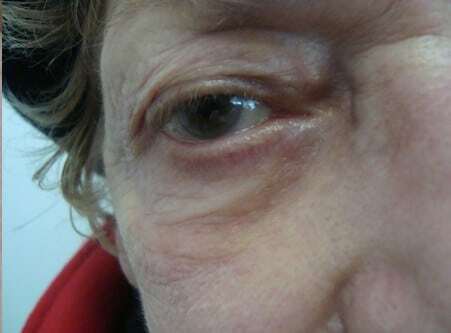 Which Problems Were Corrected with Eyelid Surgery Before & After Photos for this patient? 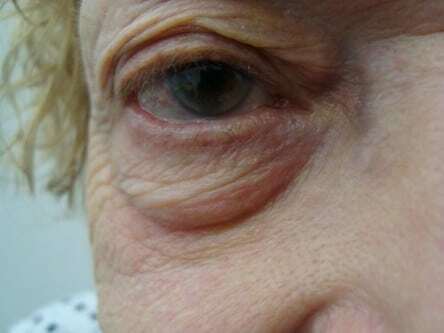 This patient has struggled with a common problem called tired eyes caused by excess skin on the upper eyelid and heaviness of the lower eyelid. Unfortunately, these are cosmetic problems that can only be corrected with cosmetic surgery. Dr Lanzer decided the best way to fix this problem was to undergo lower blepharoplasty as well as have an additional treatment with an Erbium laser. This combination of treatments does not just remove the excess skin and tissue from the eyes but also tighten and smoothen the skin. The appearance of the eyes after both the lower lid blepharoplasty procedure and treatment with the Erbium laser has resulted in a smoother appearance and a reduction of creases underneath the eyes. Blepharoplasty is the general term used to describe all cosmetic surgery procedures pertaining to the eyelid. Blepharoplasty can be used to correct defects, deformities and disfigurations. 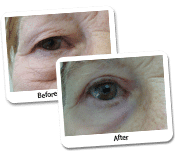 It can also be used to change the appearance of the eye region aesthetically. During blepharoplasty, the surgeon may remove or reposition excess tissue. Excess tissue can appear in the form of skin and adipocyte fat, depending on its location. During eyelid surgery, the surgeon can also choose to strengthen important muscles and tendons, significantly improving the appearance and even function of the eye region (for example range of vision). 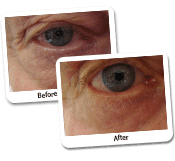 Blepharoplasty was first introduced to the medical world in 1998. After evaluation of the treatment during a medical trial, blepharoplasty became a standard in the world of cosmetic surgery. Contrary to traditional Eyelid Surgery Before & After Photos techniques, blepharoplasty is also more suitable for patients with darker skin tones, given the fact that the incision made during other outdated procedures left a visible white scar. Whereas, blepharoplasty allows the cutting and removal of lower eyelid tissue without leaving any scars. The average blepharoplasty procedure can take anywhere between 1 to 3 hours. Patients can expect some minor swelling and bruising after the procedure; this swelling and bruising usually dissipates within 1 to 2 weeks. 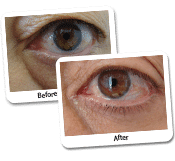 Is Blepharoplasty Executed with a Laser? Blepharoplasty can be executed with both scalpel and laser. When blepharoplasty is executed with a laser, the surgeon may combine blepharoplasty with laser eyelid rejuvenation. Laser eyelid rejuvenation and blepharoplasty can be executed at the same time, subsequently giving the patient a more noticeable result. Why Is an Erbium Laser Used During Eyelid Surgery? With the help of an Erbium laser, the cosmetic surgeon is able to remove the outermost layer of the skin. By removing this outer layer a smoother and more youthful appearance is achieved. The Erbium laser will activate collagen in the skin, subsequently ensuring that the skin become tighter and looks younger afterwards. How Long Does an Erbium Laser Treatment Take? Eyelid rejuvenation with an Erbium laser can be preformed under local anaesthetic on an outpatient basis. The duration of the treatment itself will depend on the size of the area being treated and the additional procedures that are being executed in conjunction with Erbium laser treatment. There can be many reasons why patients choose Eyelid Surgery Before & After Photos as a facial rejuvenation treatment. The majority of the reasons can be found on an emotional level, such as improving your self-esteem and self-confidence. However, there can be physical reasons to choose eyelid surgery. Often patients who suffer with a restricted field of vision due to problems such as bags under their eyes or excess skin on the upper eyelid elect to undergo eyelid surgery. Before you decide to go ahead with eyelid surgery, it is advised to book an appointment with Dr Lanzer. During your first appointment, Dr Lanzer can evaluate any problems you have and recommend any treatment options available. In general, patients will need two weeks to recover from their procedure. During the recovery process, patients may experience some swelling and bruising around the eyelids; this bruising and swelling will subside within two weeks after the procedure. Even though most people can get back to work quite quickly, it is recommended to take a small amount of time off work after eyelid surgery. Strenuous activity should be avoided for at least two weeks after the procedure. Patients who smoke should quit before they have their procedure done. Smoking increases the chance of infection and can slow down the recovery process in general, so avoid smoking as much as possible. Smoking after you have recovered from your procedure is not recommended either. Smoking can cause skin to age prematurely. To obtain the most benefit from any procedure, it is recommended to stop smoking completely.